Hi Everyone! I haven’t been able to keep up with this blog as I’ve been experiencing numerous Ascension symptoms over the past few months. Only recently have they subsided, but I am still experiencing some symptoms, but on the bright side I’m functional again! I will be writing an article regarding Ascension in the future in the hopes to help others who are experiencing the same thing as I did because it was very frightening not knowing what was happening. My good friend Jill who is a professional psychic had suggested that we do YouTube weekly readings, but I am just testing the waters of my abilities because I have closed up for a while now. But one thing’s for sure is that readings feel like home to me! So we’ll be trying these weekly readings out if these posts will reach and help others with guidance through their week. These readings may touch upon any issue in your life to gain clarity or direction. During these readings I ask for help from a collective of our Spirit Guides and Angels, that whomever may find this post be able to resonate the messages for them. Also know that if you come across this post on a different date other than what is written on the post and the reading still resonates with you, please know that your Spirit Guides and Angels have still directed you to find this post to help you through what you are going through right now. Wow- didn’t realize how much I was ranting here! You could tell I’ve been away for so long! On with the reading! The first card is the Strength card (reversed) that may signify low energy – could be mental or physical or spiritual strength. The reading may want you to pay attention to what could be draining or preventing you to realize the strength that you are capable of. If this is physical strength you may want to see if diet or sleep or stress may be a factor. In career, it could be either you lack the strength to stand up for what you believe in, or that you need more strength to continue onto a career goal. In relationships, it may be that maybe the relationship is not giving you the strength in union you were hoping for. In spirituality this card is a reminder that you have the inner strength and may lack the faith in yourself. You will need to find where in your life that you are lacking the strength and seeing if things may need to change. 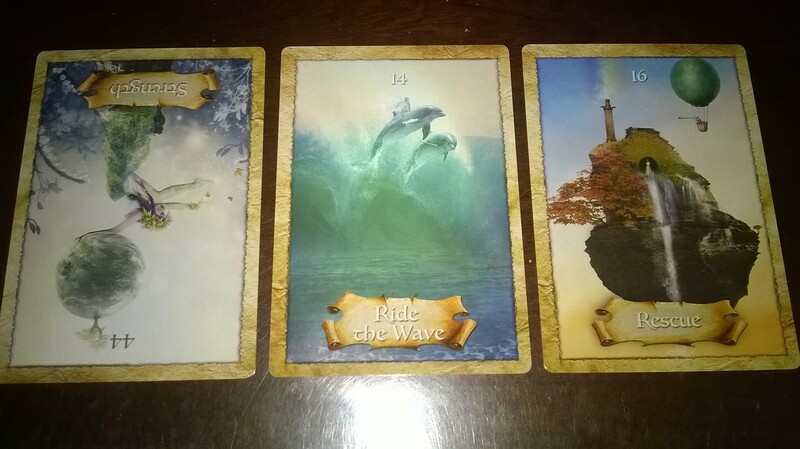 The second card is Ride the Wave card that this week something may seems like they are going very smoothly for you. This is the time to go with the momentum of what’s happening and see where it will lead you. This is a good sign with good feelings attached to this card. In career or school the week may fly by and will be an easy week for you. In relationships it may be a harmonious week and to take advantage and laugh and have fun this week! In finances it could be a better week for you, or you may find some spare money you forgot you had! Be welcome to this wave of happiness or abundance this week! The third card is the Rescue card that reminds you that if you ever need help, there will always be help when you ask for it. Sometimes people forget to ask for help and feel the need to solve things on their own. Know that you are never alone and if there is something troubling you, if you ask for help either to a friend, family, or your Spirit Guides, Angels, or God/Universe, you will get the help you seek this week. The reading wants you to know that help is there for you always. Well I hope I’m not too rusty! This is also a new deck I started working with called the Enchanted Map Oracle Cards and it seems to be a good fit for these types of readings. I hope that this reading finds you and helps you this week. Wishing you a good week! We’re all in this together! And thank you Jill Robson for this wonderful suggestion to continue to help others with the big heart of yours!